UK-based manufacturer, Fern Howard, has worked on a project to redevelop the design of the USB data stick alongside memory and storage products giant, Integral. Integral, a UK-company established at the beginning of the PC era in 1989, was one of the first to produce memory cards and USB drives for the fast growing digital market. It now supplies thousands of drives to customers around the world. 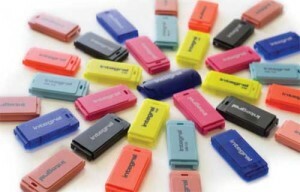 In order to be highly responsive to an ever changing demand for its products, Intergral worked with Fern Howard to develop an injection moulded USB stick that could be both produced and assembled at short notice whilst being robust enough to withstand being in bags, drawers or desks. The result, a two-piece design, fixed together using only moulded-in latches, meant that immediate demand could be met by pre-moulded cases kept in stock and hand assembled on demand – but it also meant that same design was suitable for bespoke printing and branding for third-party retailers. Now producing in excess of 10,000 units a day, these flash memory cases can be seen across the world, often carrying the livery of well-known companies – but all produced using the same tool and design. Final printing is also carried out in Fern-Howard’s Alton factory in Hampshire and the units can be printed in any number of standard colours alongside specially commissioned finishes.